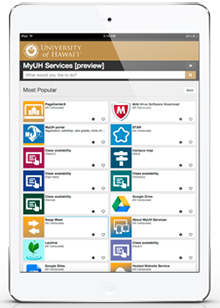 The University of Hawaii System is replacing its legacy portal with a new system that provides streamlined access to campus services from any device. The institution has selected OneCampus from rSmart, a cloud-based offering from Internet2 NET+ that will connect its 55,000-plus students and more than 8,000 faculty and staff with hundreds of online services, applications and resources on 10 campuses and educational centers across six Hawaiian islands. "We recognized the need to retire our legacy portal and looked for alternative solutions that would meet the dynamic and changing needs of our community colleges and universities. OneCampus will provide our users a simple, intuitive, and mobile-friendly way to navigate the services and applications they need to be successful on any UH campus," said Hae Okimoto, director of academic technologies, information technology services, in a statement. Features of OneCampus include Google-like search; ratings/reviews that allow administrators to analyze what services are being used and satisfaction levels; and dynamic categories such as "most popular" to promote service discovery. "Institutions can also share task-specific announcements, such as an upcoming service outage or deadline, and assign tasks to one or more campuses within the system, making it easier for users to search for and access what is most relevant to them," according to a press release. OneCampus sits on top of existing systems, directing users to a range of services through a centralized point whether they are hosted on campus or in the cloud. Campus stakeholders can share responsibility and maintenance of content on the platform without burdening the IT department. "As we approach the retirement of our legacy portal, our team is conducting beta testing with various user groups and continuing to add tasks to OneCampus in advance of the full rollout," said Okimoto. "We have also looked to other early adopters for best practices on creating early buy-in and communicating the upcoming change effectively."